In his third solo exhibition, Yeoh Choo Kuan will present breath-taking monochromatic works on canvas with strong abstract brushstrokes. Streaming Mountain is a culmination of his two previous exhibitions, which focused on rekindling his understanding towards 'Diyu', which means the realm of the dead in Chinese mythology. “Streaming” means “Liu” in Chinese, as in the painting process of slow dripping technique that acquires a sense of time in the state of fluidity. “Mountains” is “Shan” in Chinese, an allusion to the unyielding and construction of value. At its core, Streaming Mountain is a body of work measuring from the struggles within man’s value system, reconfiguring for new compatibility and extends the artist’s imagination towards the future. Two Mountains Photography Project is a ‘joint friendship’ photography project initiated by the directors of KLPA Events and KLEE, INC PARIS TOKYO, Steven Lee and Naoko Ohta, respectively. Acknowledging the iconic status of Mount Fuji in Japan and Mount Kinabalu in Sabah, Malaysia, three selected photographers from each country have been commissioned to photograph personal photo-stories about these revered peaks. This exhibition features works of Nadirah Zakariya, Nana Safiana, Stacy Liu, Atsushi Okuyama, Mikio Hasui and Yuki Morita. 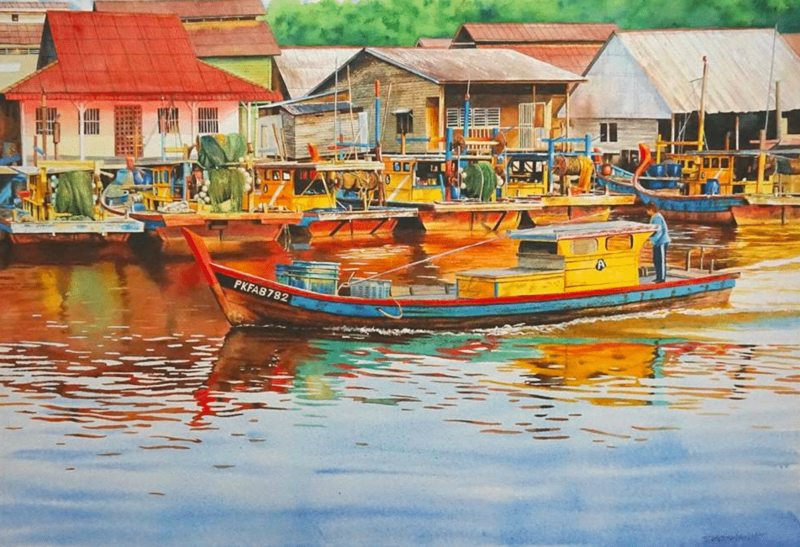 Watercolour artist Goh Siao Shan takes you on a journey into the Malaysian settlements through a series of drawings bearing his signature style. His fascination with painting boats on the water is intriguing with a high level of detail to be looked into. This is the artist's first solo exhibition. Artist group Opposites Abstract is hosting an exhibition titled 'Non Finito' at the University of Malaya Art Gallery. Literally translated to mean ‘not finished’, artists were invited to create works that expressed their thoughts on the subject. Some prompts include the question of whether an artwork is only perfect once it is ‘complete’, and how even does one declare an artwork ‘complete’? Numerous abstract pieces in various mediums will be on display. Wei-Ling Contemporary's first exhibition of the year, ‘Paralogical Machines: When Images Meet Us in Space and Time’ is a new media exhibition presenting some of Europe’s and Southeast Asia’s leading media artists. It is an unusual display of artworks that invites visitors to look beyond time and space through paintings, photographs and other installations -- each creating a dialogue between one another. The artists involved include Charles Lim, Erika Tan, Rajinder Singh and Ubermorgen with Nye Thompson; some of whom are exhibiting artists whose works have been shown in biennales and museums around the world. There will also be a public talk with the artists on the opening day to discuss these conversations between human and art. Dispersing Sublime: Towards A Bacterial Landscape is an exhibition that explores what constitutes creative will when the artistic agency is shared between an artist and the most basic form of life on earth, the bacteria. In the exhibited works, Nur Amira relies on the biological process of the bacteria over time to produce a visual form within a controlled environment that says something new about what is a landscape. The artist explores its relevance to a genre of contemporary art called, bio-art -- surrendering to the larger existential questions of life in a microscopic world. In deciding to stage an exhibition of bio-art works, Nur Amira uses parts of her PhD research to reflect on our contemporary research culture. It is a discovery that is truly mesmerising beyond the naked eye.